A Purdue Veterinary Medicine faculty member is receiving a $1.6 million grant from the National Institutes of Health (NIH) to further study whether two FDA-approved drugs can be repurposed to treat life-threatening drug-resistant bacteria. Dr. Mohamed Seleem, associate professor of microbiology in the Department of Comparative Pathobiology, will lead the research team. "There is an urgent need for antimicrobial drugs to treat superficial and invasive infections because of the growing threat of antibiotic-resistant bacteria," Dr. Seleem said. The World Health Organization has compared the rising number of drug-resistant infections to a "slow-motion tsunami" that has the potential to kill millions and undermine the global economy. The Centers for Disease Control and Prevention (CDC) reports at least two million people a year in the United States become infected with antibiotic-resistant bacteria. Two of those bacteria are Clostridium difficile and Methicillin-resistant Staphylococcus aureus, or MRSA. The NIH funding will focus on repurposing one approved drug, auranofin, and one clinical molecule, ebselen. Initial tests show ebselen, which doesn't yet have a proven use, is effective against MRSA, while auranofin, approved by the Food and Drug Administration (FDA) for long-term treatment of unresponsive rheumatoid arthritis, is effective against Clostridium difficile. MRSA causes illnesses ranging from skin and wound infections to pneumonia and bloodstream infections that affect more than 80,000 people a year and kill more than 11,000. Clostridium difficile is a life-threatening diarrhea that the CDC says infects almost a half million people a year in the United States and kills 15,000, often striking people who are hospitalized or have recently been hospitalized. Dr. Seleem said preliminary testing has shown ebselen and auranofin to be more effective than the current drug of choice, vancomycin, for both bacteria. The two drugs also reduce the excessive immune response of the host, reduce the toxins secreted by the bacteria and protect the host tissues from the damage of the bacterial toxins. Dr. Seleem previously received startup and university grants to purchase about 4,000 out-of-patent drugs for screening to see if they can be repurposed as antimicrobials. 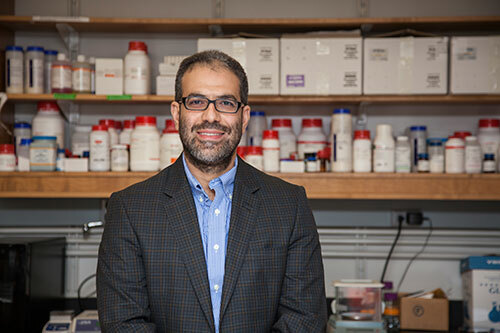 Dr. Seleem said the advantage of using existing drugs is that they have already been deemed safe for humans and don't require the time-consuming, costly, and high-risk venture usually associated with drug development. "It can take 15 years or longer to move a new drug through the approval pipelines," Dr. Seleem said. "The solution is to find drugs that we already know are safe." Dr. Seleem further explained that about 30 percent of drugs approved by the FDA are repurposed, but no drug has ever been repurposed as an antibacterial. Click here to view a complete news release about Dr. Seleem's research.